BCK Products is dedicated to customer satisfaction offering the highest quality nylon, cloth, and mesh laundry bags as well as bio hazard bags and heavy duty laundry bags for bigger jobs. We offer laundry bags for sale at affordable prices made from materials you can trust and feel good about buying. With over twenty years of experience in the industry, we supply only the best products at the best price. Our Visa laundry bags are made from recycled table cloth material and are available in mixed or solid colors and in different sizes upon request. Need an oversized laundry bag? This could be the choice for you. Mesh laundry bags are strong yet flexible, perfect for travel or for making laundry day simple. These are available in a number of fun colors and come equipped with reinforced handles. Use these at home or at work for the perfect heavy duty laundry sorter. Net laundry bags are breathable and can be utilized for many practical uses. Our nylon laundry bags are sturdy and durable, offering extra strength when needed. 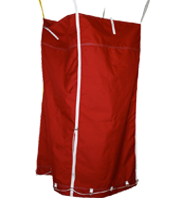 These extra large laundry bags can accommodate a home or business space. Need commercial laundry bags for hospital or medical use? These heavy duty laundry bags can be ordered in bulk and with the biohazard logo for safe use. Order our bags in the color of your choice, all equipped with webbing or drawstring for easy closure. Made of 100% vinyl coated woven polyester mesh, that won't tear, crack nor rip..
Our slings are made to fit all your customer operations. competitive prices, fast service, high quality. 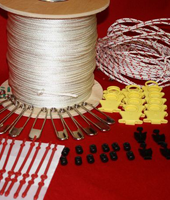 sling repairs are available at a very low cost (compared to new) call us for more information.